This is a complete collection in modern English of the key texts describing Saladin’s conquest of Jerusalem in October 1187 and the Third Crusade, which was Christendom’s response to the catastrophe. The largest and most important text in the book is a translation of the fullest version of the Old French Continuation of William Tyre for the years 1184-97. This key medieval narrative poses problems for the historian in that it achieved its present form in the 1240s, though it clearly incorporates much earlier material. 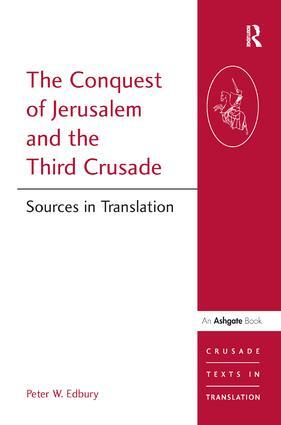 Professor Edbury's authoritative introduction, notes and maps help interpretation of this and other contemporary texts which are included in this volume, making it an invaluable resource for teachers and students of the crusades. Contents: Introduction; PART I: The Old French Continuation of William of Tyre, 1184-97; PART II: Selected Sources; 1 The Marriage of Guy of Lusignan and Sibylla (1180); 2 The Coronation of Guy and Sibylla (1186); 3 The Battle of Cresson (1 May 1187); 4 The Battle of Hattin (4 July 1187) and its Aftermath; 5 The Repercussions of Defeat; 6 The Siege of Acre (1189-91); 7 Richard the Lionheart in the Holy Land (1191-2); Select Bibliography; Index.